New character posters have been released for upcoming tvN drama ‘100 Days My Prince‘. ‘100 Days My Prince‘ is a historical romance drama centred around Crown Prince Lee Yool (played by EXO D.O) who is perfect in all ways and Yoon Yi Seo (played by Nam Ji Hyun) who is a noblewoman with equal measures of wit, charm and beauty. However, in a twist, both characters have alter egos, Lee Yeol is also the useless fool Won Deuk and Yi Seo is the headstrong Hong Shim. In his individual poster, D.O gazes deeply into the camera with a serious, lonely expression. He is surrounded by red umbrellas, dressed in traditional princely robes and with a headpiece meant for crown princes, he exudes a cold, solemn aura. 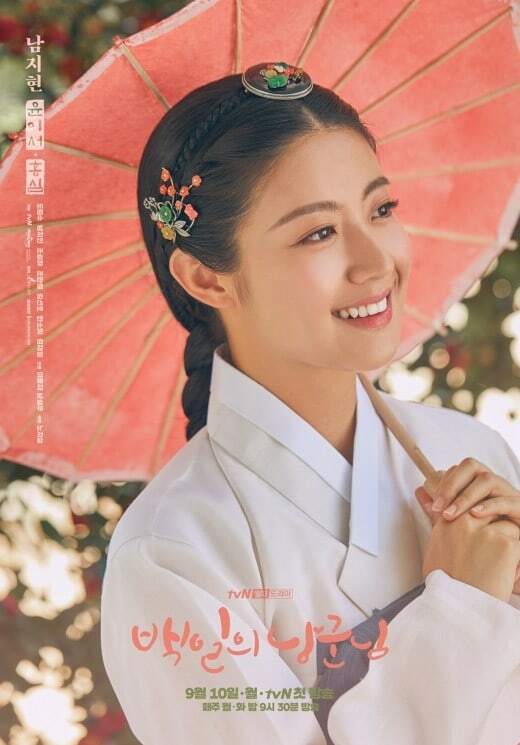 In her poster, Nam Ji Hyun gives a completely different feel to D.O. She is holding a red umbrella and sharing a bright, happy smile with the world. She exudes a warm and carefree appearance, but she is hiding a secret. In the other posters that have been released, we get a glimpse of the sweet romance that will unfold and also the amusing moments that occur when Won Deuk attemtps to undertake some simple household chores. ‘100 Days My Prince‘ is scheduled to commence airing on September 10 at 9.30pm KST. Are you looking forward to D.O‘s new drama ‘100 Days My Prince’? Let us know your thoughts in the comments below.